I am a student learning to play the piano, I am 61 years old and this is my story about why I co-founded Learn Keys by Ben with my piano teacher Ben Camp. Actually, it started around 5 years ago. I was 55 and I wanted to do something for myself, I decided on Piano Lessons. The weekly lessons continued until 2016, and then in 2017 Ben and I decided to create a service where busy people can do something like learn to play the piano…online. 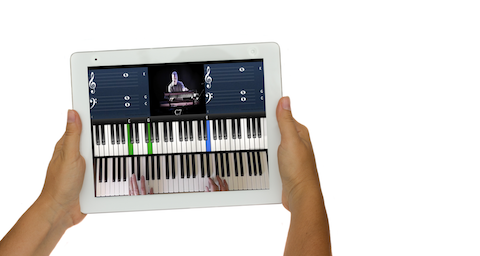 We created Learn Keys by Ben for people to learn how to play piano the way they want to learn. So, if you want to play the blues, pop songs or jazz this program can give you the skills to play what you want the way you want. We set out to create the similar process that occurred in each weekly lesson. There was a plan in the curriculum that Ben provided me and each week Ben would introduce something new he wanted me to learn. He would video himself playing what he wanted me to learn and give me a sheet music of the lessons and when needed he would also provide an audio clip of music or a rhythm beat to help me in learning timing and how to accompany on the piano. So, in every session in Learn Keys by Ben there are these elements, a video instruction, sheet music and audio clip. In the video, Ben gives instruction in what he is doing on the keys and what he wants you to focus on. These sessions are then sequenced for you to follow a regular progression. You can also experiment around as there are several practice grooves and songs in the curriculum. You can stay on one lesson as long as you want or play it in half time to better learn the mechanics. You can practice any time you want the site is available 24 hours a day every day. For me this has been a fantastic advantage for learning how to play the piano. I put all my kids through music instruction when they were young and they all play. Now I can enjoy sitting with them and jamming in the garage several times a year. I am glad now that we are able to offer to you the ability to learn how to play no matter how busy you are. If you have had lessons in the past great, even if you took them when you were a kid. The program starts at the very foundations of note names and scales. I would invite you to do this for yourself. Start something new. You will not regret it. Go to www.learnkeysbyben.com and sign up. We give the first thirty days for free. If this is not for you then you can cancel any time in the thirty days with no penalty. If you continue it is $16 a month for a complete membership. Ben is adding new songs and sessions every week. There are now over 200 in the library. Once you sign up we will send you weekly emails called “Practice Tips”, these are simple but useful tips to help you in making your learning to play a success. Sign up and have fun.